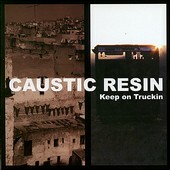 Boise, ID rockers Caustic Resin's latest, Keep on Truckin' finds the band weaving in and out of Black Sabbath territory, fusing their brand of hard rock with elements of space-rock, grunge, and even some jam going on to heighten the experience. This is a heavy, hard-hitting record, propelled by the almost psychedelic cuts like "Wizard of the Upper Snake River", the title track, and the thick "Viva La Causa!". It is a listening experience - to say the least. One that can't be put into words. Its intricacies and acid-drenched rhythms too deep and imbedded to merely put to paper. I'll give it a B.